Hello there fellow Citizens! Check here for part 1 of the two part Vanguard variant Q&A. Technical Designer Calix Reneau @ CIG Santa Monica answers 10 questions about the Vanguard variants. Part 2 comes Friday! 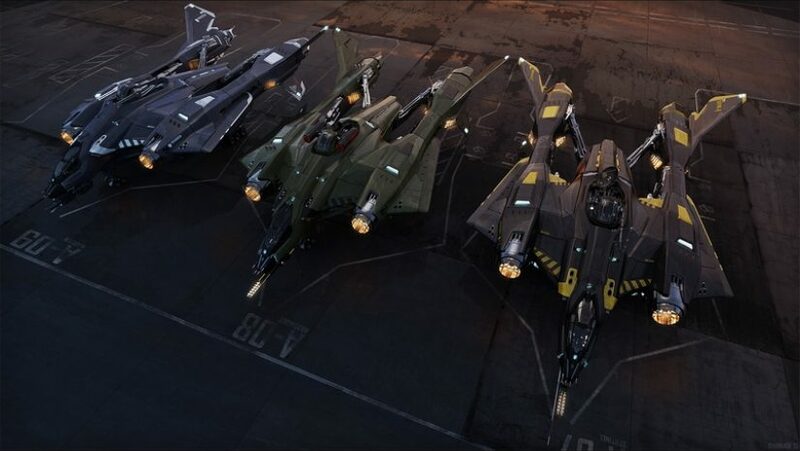 When the Vanguard is Flight ready will we be able to swap from the variants and vice versa if we own the Battlefield Kits for Arena Commander? Is the main nose gun on the variants the same or different than the Warden? People keep speculating the Harbinger has railguns, but I see no text that confirms that. Yes! All three Vanguards will have different nose guns. The weapons for the Harbinger and the Sentinel are still in development with the component pipeline, so they may different somewhat in appearance from the versions used in the concept art. The central gun on the Warden is an APOC Death Ballistic Gatling gun, while the central guns on the Sentinel and Harbinger are a plasma gun and a mass driver rail gun, respectively. (Manufacturers have yet to be assigned.) The four secondary guns are also different. The standard model uses Behring M4A lasers, the Sentinel has two distortion cannons and two MaxOx electron guns and the Harbinger has four higher damage lasers. How do the E-War capabilities of the Vanguard Sentinel compare to other ships which are supposed to have them, like the Herald? The Sentinel is intended as something of a ‘trickster’ ship, oriented towards causing confusion on the battlefield. From EMP pulses to command and control interference, the Vanguard Sentinel will support battlefield operations by making it all that much harder for opponents to stay in contact and have proper information. The Herald, on the other hand, is built around a different goal: intercepting and relaying valuable transmissions and other data. Both ships have some ability to do the others’ role, but they will likely find success in different places!